Restaurant was formerly Cherry Grove Pizza. Excellent food and free delivery for orders over $15.00. Appetizers, salads, hot and cold 10" subs, Gyros, hand tossed pizzas, traditional pizzas, white pizzas, 14" calzones, 14" strombolis, pasta and desserts. Excellent friendly service. Margarita pizza was outstanding. Jalapeno poppers were awesome. Beer was cold! Great pizza! Friendly staff! Will return! We have gone to Babaka's for several years (and multiple times during a visit) during our family vacation. This year, we were very disappointed. The toppings on the pizza were not very plentiful before, but have gotten even less. The subs got smaller and there were only 2 slices of meat on them. The calamari is no longer freshly breaded and seem like premade frozen calamari, not near as good as it had been, but the prices are still the same. Definitely getting less for your money. Sorry to say this is a tradition after many years that has come to an end. Being from south Philadelphia, the land of great pizza, subs, pretzels, and cheesesteaks, this pizza had really good flavor. I didn't try much else other than the chicken fingers and mozzarella sticks, which were also good. The only downside is that l didn't get pizza from anywhere else so l have nothing to compare it to; no need to...really good! Food is good, but not good enough to be gouged . It is not right to raise the price just because its tourist season.... The place right next door called basils is just as good and they have the same prices all year round and are much more friendly. $20 bucks for one three topping stromboli??? . We live less than 2 miles away. Ordered meal lovers, each slice has two pieces of pepperoni and a couple smaill pieces of sausage. Also got a small veggie pizza. Total cost of $36.00. I swore the last time we were there I would not return. Only went there as traffic on Hwy. 17 was backed up. The owner and his son, manager, was both arrogant as hell. NEVER AGAIN AND I WILL TELL EVERYONE I SEE. Had a menu and coupons on the fridge in our condo. They advertised a 2 for 1 pizza lunchtime "special" on the menu. It didn't appear to be a coupon to me. I showed up to pick up my order without the menu and they said I needed a coupon and wanted to charge me full price. I explained that I thought it was a special and that I didn't think to bring the menu. They were very rude about it, like I was trying to pull one over on them. I started to walk out and they stopped me and gave me the special price. The pizza was very good and I will try them again, I just hope management isn't so rude. From: Hidden Valley , PA.
we are in cherry grove every sept. Are you open at all in Sept. The past couple of years we have not been able to find the shop open. We have enjoyed your pizza in the past and would like to do so again. We had our order delivered and it took FOREVER!!! By this time we were starving, if it wasn't for that I would have threw everything out. The bottom of the pizza was burnt and it was cold. Won't go back there ever. We live here and were surprised that our pizza was priced $4 more than we pay in the off season. Competitor charges the same year around. We think gouging is not a nice thing for a business. My husband and I discoverd a small quaint restaurant nestled by the beach in cherry grove. We tried it and to our delight, it was splendid! The food was hot, fresh, and tasty. The first time, we tried the pizza. It was the best I've ever tasted and I have tasted plenty! The second time we went for the speciality sandwiches-meatball and chicken parmesans. Unbelievable flavor,delicious! I would recommend Babaka's to everyone. We come every year from New York, and we make it a point to stop here. We love the pizza and all the different food choices. The pizzas look amazing and are cooked perfectly. We can eat there everynight, and sometimes do!! I would absolutely recommend to anyone to stop here if they really know about good food. We ate in. The pizza was okay, the baked in 15 inch blode hair not okay. Went up told a girl about the meal ruining hair and she pointed to a no refunds sign. Then pulled it out of pizza and tossed in trash ,left pizza on counter like i was supposed to eat it now. Then another girl waled up and said whats wrong i told her about the hair she shrugged her sholders and walked away. While in the res. several angry people said dont bring our food we dont want it claiming delivery was hours long. We left mad and couldnt believe they did nothing about the hair pizza so gross. Will never ever ever go back. I feel alot of the positive reviews must be from the owners!!!!!!!!!!!! Our first experience with Babaka's was not good to say the least. We dined in one afternoon and found the mamagement to be rude, abrasive, and unaccommodating. Their ONLY saving grace was that the calzone was amazing! Tonight, we ordered pizza delivery. The pizza was great, and although they said 45min it was here in 30. Also the delivery person was very nice. Great job! Judging from the other reviews here, maybe the trick is to get orders to go. Maybe the management will wake up and realize that no matter how amazing the food is, people usually are not willing to over look bad service. And with so many other places to spend our money, if it were me, I'd focus my efforts on fixing the service. I don't know how anyone can say this was good pizza! The small pizza was the smallest we've ever seen- and so bland if we hadn't already paid for it we would have thrown away (needless to say, the pieces we had left did not go home with us). First night at mb and wanted something quick. Ordered 2 large pizzas 1 - cheese and 1 - philly cheese and 2 side orders of fries for delivery. They said it would be about 45 min but it took about 1hr and 15 min. The pizza would have been better if I had gotten 2 frozen pizzas from the store and the fries were soggy with grease. The philly cheese pizza was suppose to have onions peppers and steak. On the whole pizza we counted 3 small peices of onions, no peppers and no steak.. 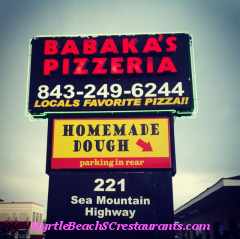 I ordered two pizzas from Babak's a couple of weeks ago (I have a new home in Cherry Grove) - they delivered, so I've never actually been IN the restaurant. The pizza was awesome, very fresh, great sauce, cooked just right. It's a little pricy, I think, but still worth it in taste. If my budget allows, I will eat there often. WE ORDERED DELIVERY so ignore the ratings regarding the restaurant. (Questionaire is not set up for delivery experiences) We ordered our favorite type of pizza, a "Hawaiian" (Pineapple & Ham) It was definitely the best Hawaiian pizza we have ever had and trust me we have had many from many places including Italy over the years. Everything tasted fresh and homemade. Delivery time was 30ish minutes. Give'em a try! Went here for take out. Pizza was below average pizza. Very greasy and bottom was burnt. Will not return here.. Ordered from here because saw the ad in the travel book where we were staying. Ordered a salad, a spaghetti dinner and a large pizza with extra pepperoni....$36!!!!! Ok, so figure it must be pretty good. Salad was excellent. Spaghetti was average. The extra pepperoni pizza has only 20 slices of small pepperoni on a large pizza. Called to complain. Got hung up on twice. Finally asked for the manager. When I asked him about the double pepperoni, he did not say they made a mistake, he said that's all you get on a double pepperoni. Asked him to bring me one with double pepperoni. Said they would NOT bring another pizza but would be here shortly to pick this one up and refund our money. Fine, we called someone else. Next thing we know there is a knock at the door. The Babaka people were back at the door with a replacement pizza. When we told them we had already ordered another pizza from someone else because they refused to give us a replacement and said they were coming to pick this one up they stated that they had never said this. Take the new pizza or leave it. Very, very poor service, rude and inconsiderate to the customer. The delivery boy finally admitted they had made a mistake on the first pizza which they would not admit on the phone. We ended up eating the pizza we ordered from the other place and are stuck paying for a pizza we did not want and which they messed up on. Would have taken the replacement had they stated that was what they were going to do when we called originally. Got it for delivery and the pizza was great and was delivered very quickly. This is not a "eat in" restaurant. It is not about atmosphere. This is about THE BEST PIZZA in the area. The crust is EXCELLENT. The sauce is EXCELLENT. Fresh ingredients, sauce made on premises, hand tossed crust. Again this is carry out. The kitchen is clean and orderly. I love pizza and I very particular about every detail. This is one of my favorite pizzas anywhere. BEST pizza in Cherry Grove!!! Crust and base are not burned and does not have a floury residue. Delivery is GREAT!!! They offer a varied menu, with excellent foods to include: appetizers, salads, hot and cold 10" subs, gyros, hand tossed pizzas, traditional pizzas, white pizzas, 14" calzones, 14" strombolis, pasta, desserts and beverages. The food quality is great and delivery is available for orders of $15.00 or more. We have eaten their food numerous times and it is some of the best in the Cherry Grove area! This restaurant has excellent pizza and other menu products. They also have free delivery for all orders of $15.00 or more. They offer quite a varied menu. We have ordered from them more than ten times, recently, and have always been pleased with the best pizza in the area! Give them a try if you don't believe what I am saying!! !